At UC Santa Cruz, plans are in place to significantly expand the campus by 2020, with the addition of new buildings, new roads, and nearly 5,000 more students. Already approved by the UC Regents, the University's Long Range Development Plan (-the LRDP-) includes a 90-thousand square-foot biomedical sciences facility, a 50-thousand square-foot social sciences building, student housing, faculty housing, and a new road creating an additional campus entrance on Empire Grade. The LRDP also calls for 4,500 new students, increasing total enrollment to 19,500.
substances; as well as the clearing of 120 acres of forest habitat. 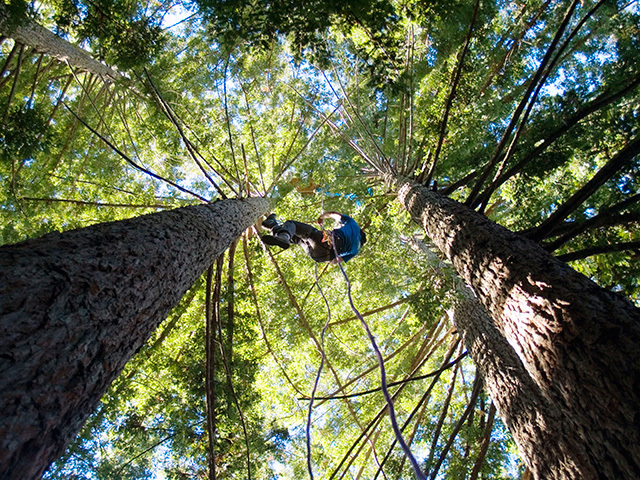 In the early morning hours of Wednesday, November 7, several people climbed into threatened redwoods at the site of the proposed biomedical sciences building. High up in the trees, they installed platforms and began a treesit as part of ongoing efforts to increase awareness of, and opposition to, the LRDP. Later that morning, 300 students and community members held a rally and marched across campus to the site of the treesit. UCSC police had the trees surrounded, preventing protestors from reaching the treesitters. When the protestors pushed past the police line to reach the treesitters with food and water, they were pepper sprayed and some were hit with batons. Despite this, they managed to get past police lines and provide needed supplies. On Tuesday, November 13, I interviewed Jennifer Charles, spokesperson for the Science Hill Treesit, about resistance to UCSC's LRDP (Long Range Development Plan).